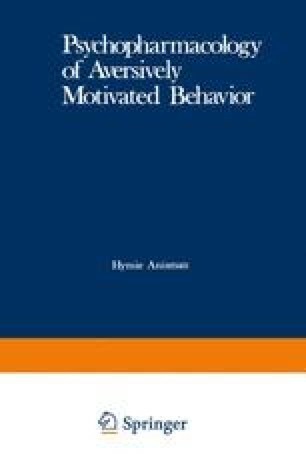 A broad survey of the organization of aversively motivated behaviors as well as the pharmacological evidence on the physiological-biochemical substrates that subserve these behaviors has been provided in the first six chapters of the present volume. The purpose of this chapter is to analyze a wide variety of behavioral effects of several agents that are not comfortably subsumed under the previously discussed headings. At the same time, the reader should be aware that the following discussion is in many ways complementary to the analyses carried out previously. This is illustrated, for example, by the fact that different types of neuroleptics, with variable profiles with respect to biochemical changes (e.g., greater or lesser antinoradrenergic properties given a particular antidopaminergic effect), are used routinely in the analyses of the neurochemical substrates that sub-serve simple behavioral responses (see, e.g., Chapter 5, and Schenker and Herbst, 1963; Bradley, 1963; Janssen, 1965; Gordon, 1967a; Crismon, 1967; Bobon et al., 1970; Forrest et al., 1974; Fielding and Lal, 1974; Gordon, 1974; Iversen, 1975; Iversen et al., 1975; Matthysse and Kety, 1975; Sedvall and Uvnäs, 1975; Usdin and Bunney, 1975; Wyatt, 1976). This notwithstanding, several effects obtained in more complex testing situations either with neuroleptics or with various other drugs not included in previous chapters (ethanol, hypnotic-sedatives, tranquilizers, narcotics, and several stimulants excepting amphetamine and related agents) need to be examined in behavioral terms. In fact, if an analysis cutting through several levels of organization is to take a substantial step forward (relative to the achievements that have been made so far), then behavioral models of drug effects are required which are more sophisticated than those that simply emphasize the analogies and differences of profiles obtained by conventional testing methods.